What Can Provo Learn from Fort Collins? A couple years ago my husband and I made a trip out to Fort Collins, Colorado where we discovered that a city very similar to Provo has created a truly amazing bicycle culture. Students, families, seniors, and avid-cyclers were riding everywhere we looked. The cycling culture brought business to their bike-lined downtown, generated a very real sense of community, and gave the city some extremely favorable media attention (they were awarded the #2 spot in Money Magazine’s top 10 Places to Live 2008). It can be a bit difficult when cycling advocates try to take on the same types of projects that Portland does – Provo and Portland are very different. However, Provo and Fort Collins are extremely similar in the ways that count. Both are medium-sized cities with generally flat roads, a historic downtown, a major university, and a snowy winter. If something can work for them, it can probably work for us. An integrated trail / bike path system. When we visited downtown Fort Collins, we were given a map with all of the city’s bike lanes and trail systems – wow, there were a lot! We were able to go pretty much anywhere we wanted with minimal road-sharing. Bike lanes make traveling safer and more enjoyable for both cyclists and motorists. All of these lanes and trails took a lot of advanced planning. But, they were well-used and worth it. 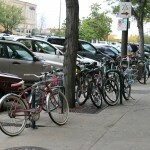 Tons of bike parking. 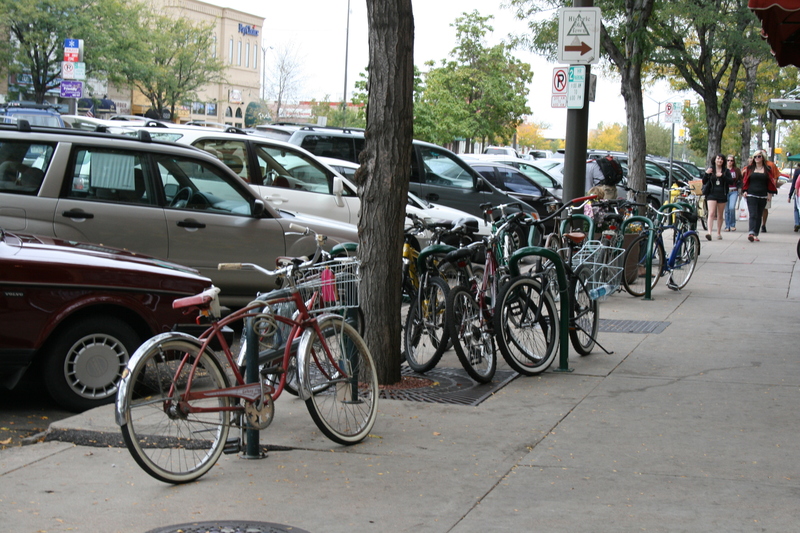 Although there were probably over a hundred bicycles parked downtown, we had no trouble finding bicycle parking. Racks were plentiful and in good condition. An amazing bicycle library. 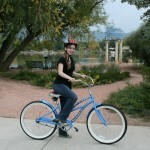 Although we were visitors to the city, we were able to borrow a couple of bicycles for the day. 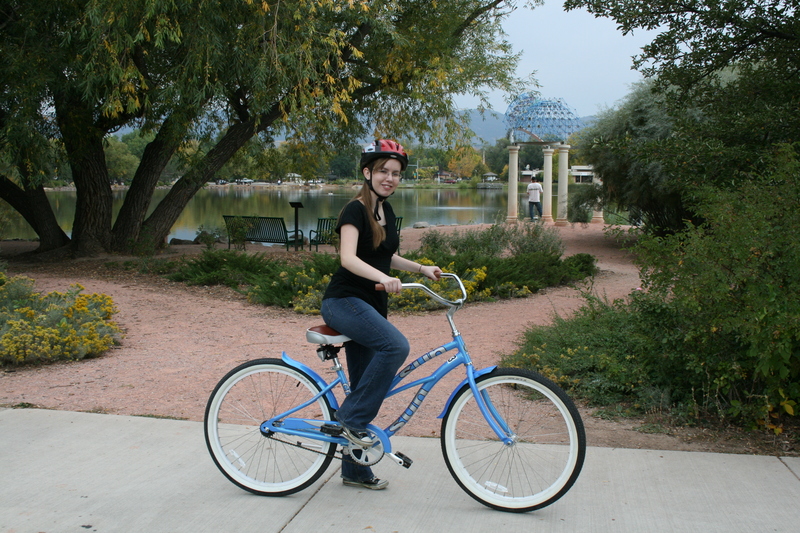 The Fort Collins Bicycle Library gave us a cruiser (pictured above) and a mountain bike to use without any cost at all. 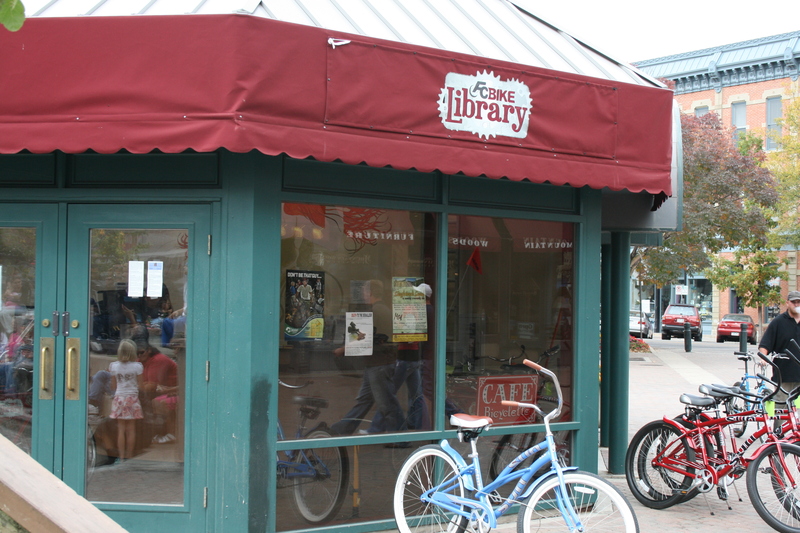 The bicycle library is sponsored by various Fort Collins organizations and businesses. It’s an amazing service with a prominent downtown home. Education, education, education. Everyone does their part to educate residents on safe, effective cycling. 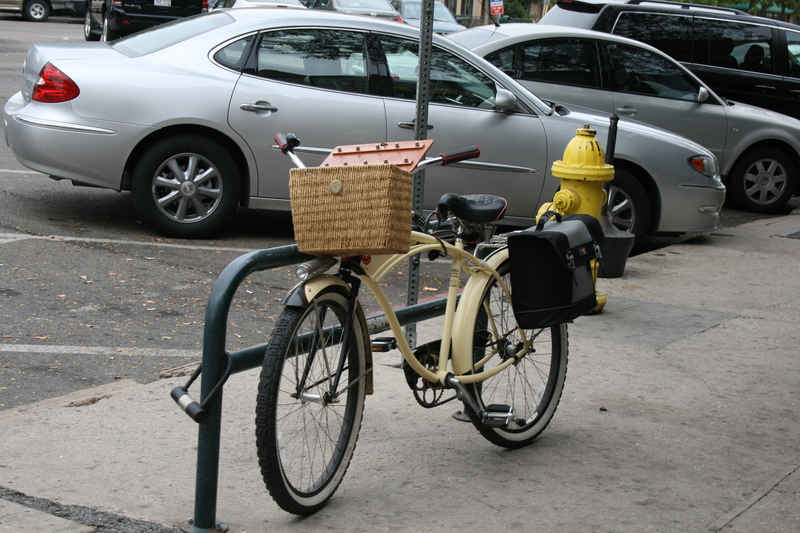 The city has a webpage dedicated to bikes with many links to local resources. When bicycles and cars are supposed to share a lane, these lanes are clearly marked. Information about how to share the road is everywhere. Private organizations like the Fort Collins Bicycle Co-Op help people learn how to ride safely and provide bikes for those who can’t afford them. These four projects had a huge impact on Fort Collins bicycle culture. They also made the city a better place for everyone to live. Hopefully, as we work to make Provo more bike-friendly we can keep in mind some of the ways our cycling sister-city has found success. 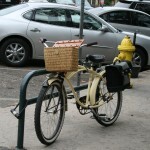 This entry was posted in Bike Advocacy and tagged Fort Collins, Provo by Jamie. Bookmark the permalink. This is a great article! Thank you for the insight and for the great ideas. I would completely agree that Provo is just as able as Fort Collins to promote cycling as a lifestyle. I really like the comment “bike lined downtown” there has been a lot of research lately saying that the more bicycle freindly historic downtowns are, the more they prosper. One instance from a city in Florida said when these measures were made their downtown went from 80% vacant to 80% occupied. The fist step in any of this is for us all to get out and ride more. Thanks again it makes me happy to see articles like this about Provo. Zac, I’d love to read any of the bike / downtown studies you know of. If you have links, please do share!